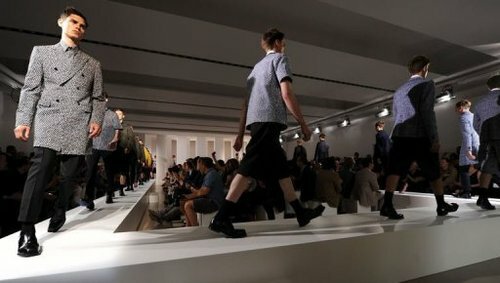 MILAN - After a seven-year absence, German designer Jil Sander made her comeback on the Milan catwalks Saturday to a rapturous reception with her menswear collection for spring-summer 2013. Visibly moved, the 68-year-old queen of minimalism, her blue eyes framed by her trademark blonde haircut, emerged in an immaculate white linen shirt to take her bow and accept the warm applause for her show. Minimalist is what I was, and minimalist is how I'll stay -- this could be the mantra for the designer, whose show was the first down the runway in the menswear shows which end Tuesday. Her vision of menswear is evolving, the house explained in a press release. "The Jil Sander man likes form and formality. The core of the collection is the precision cut, executed with a knife." Sander, who took back the reins from Belgian designer Raf Simons after he was named to Dior in April, experimented with layering and eye-catching contrasts: the playful pairing of a sleeveless blue coat with a white shirt, cropped pants baring ankles and bermuda shorts morphing into culottes. There was a whiff of nostalgia for well-scrubbed schoolboys in their blouses in the 19th century or jaunty sailors on shore leave in the silhouettes. A midnight blue cardigan with acidic lemon, emerald and scarlet stripes was a nod to the abstract Dutch painter Piet Mondrian. Blocks of colours, red, green and blue, dominated the collection, while natural fibres -- poplin, cotton, silk, mohair, wool and linen -- had pride of place for fabrics. Sander, who founded the house that bears her name in 1968, left in 2004 after falling out with its new owners, the Italian group Prada. Since then she has collaborated with various outfits, notably the Japanese group Uniqlo. Dolce&Gabbana again turned to Sicily for inspiration, sending non-professional models from island streets on to the catwalk to the tunes of a live Sicilian orchestra. Their "faces' personality, simplicity and natural beauty are a source of inspiration", the designers said. Tank tops with sky-blue and red stripes seemed to come right from island beaches, just like the tight mini-shorts with plaited leather belts. In 1950s style, suits had pleated trousers and light jackets. T-shirts came XL and with colourful Baroque design. Colours were mixed -- an ivory jacket was worn to mouse grey trousers. Donatella Versace opened her show with an apparent tribute to antiquity: thigh-length tunics with Greek motives worn with a boxer belt worthy of Mike Tyson, models sporting gleamy chests wearing micro-briefs. Versace's businessmen keep their suits but lost their sleeves and had their shoulders padded. Dominant colours were blue, green, rose and anything metallic, which is also popular with Burberry. On Sunday Bottega Veneta, Salvatore Ferragamo, Calvin Klein, Vivienne Westwood, Trussardi, Prada and Roberto Cavalli will present their collections. Milan's Male Spring-Summer 2013 Fashion Shows end on Tuesday.